A wave of angry complaints by parents of students at a small elementary school has succeeded in convincing LA Unified to replace a principal whom the parents described as unfit for the job. 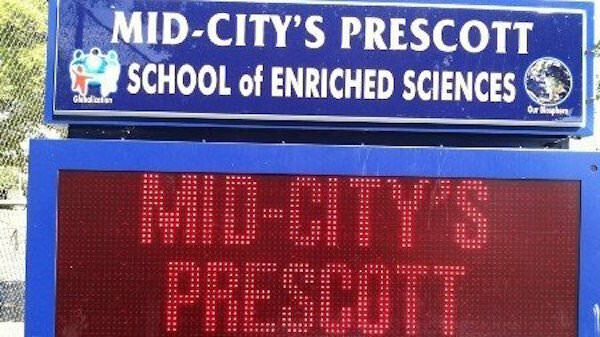 The parents at Mid-City’s Prescott School of Enriched Sciences Magnet Elementary School, one of the district’s original four magnet schools, gathered 119 signatures in a petition from a school that has 250 students, 1st through 5th grades, and said they have been lobbying for help from LAUSD for more than a year. As a result of their efforts, according to two parents who said they spoke directly to Superintendent Ramon Cortines, Gail Greer will no longer be the school’s principal. LA Unified spokesperson Shannon Haber declined to comment on the change, saying, “all personnel matters are confidential.” The Associated Administrators of LA, a union that represents principals, said as of yesterday the union had not been notified of a reassignment at the school. Cheryl Hildreth the Educational Service Center West Superintendent, sent a message via ConnectEd to all parents at the school today, informing them that Greer will not be returning and that an interim principal will start the new year and will implement basic improvements. She also said that stakeholders will be involved in selecting the long-term principal. LA School Report was unable to reach Greer. No one answered the phone at the school, and an email sent to her seeking comment went unanswered. Because the school was not regarded as “failing,” parents could not implement a change through the state “parent trigger” law. As their next-best option, they began a petition drive and pressed the district on their own to force a change. D’Souza said the PTA was not allowed to meet on campus after challenging the principal on certain issues. He said attempts by parents to get involved in their children’s education and school on any level have been blocked by the principal. “She leads with intimidation and retaliation, runs the school as a dictator, … and severely limits or obstructs all forms of parent participation and communication,” according to the petition. D’Souza’s wife Alexis Song was serving as secretary of the School Site Council, and said she was booted off the council after asking questions about how some of the school money was being spent. They have a son going into the 2nd grade. “Things got so bad, there was overwhelming evidence of the problems at the school,” said Song, who filed a Uniform Complaint Procedure (UCP). Song said the response showed that the school was out of compliance on all of her complaints, and the principal was not cooperative in trying to change things. The Title 1 elementary school with 10 teachers is the official feeder school into the highly-regarded Los Angeles Center for Enriched Studies (LACES), and parents were concerned that the students weren’t prepared for the school when they transferred over there. “We hope to be involved in choosing the next principal, too,” said Song. 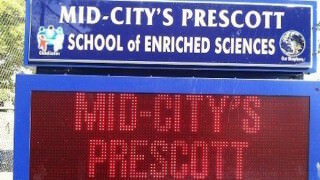 * Adds that the district confirmed to Prescott parents that Greer is no longer principal.